Having surpassed Cameroon legend Roger Milla to become Africa's oldest international player, Mauritius striker Kersley Appou is showing no signs of slowing down. Last month Appou set the new record when, aged 43 years and 354 days, he played in a 2015 Africa Cup of Nations qualifier against Mauritania. And while that 1-0 defeat called time on his country's campaign, Appou is eager to be part of the next challenge. 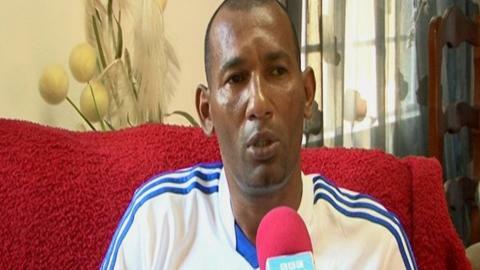 "I am very proud to have broken Roger Milla's record" Appou told BBC Sport. "Milla is not only an African legend, but an international icon. "We cannot compare ourselves but the record is mine. "It was not easy at my age to have been chosen to play for Mauritius but the coach Akbar Patel has faith in me. And I will continue to deliver as long as he needs me and as long as God wills it." Appou, who celebrated his 44th birthday on 24 April, attributes his longevity to "following a strict regime" as well as eating plenty of fruit and vegetables. He also gives reserves special thanks for his wife and three children, who he says have always supported him. MacDonald Taylor Sr, from the US Virgin Islands, holds the world record of 46 years and 217 days. During his career, he has played for a number of clubs in the Mauritian Premier League, including Roche Bois Boys Scouts, Fire Brigade, Association Sportive Port Louis 2000, Curepipe Starlight, Pointe aux Sables Mates. It is a sign of his durability and consistency that at his current side, Pamplemousses, he is the top goal scorer. Over thirty years ago, Appou was kicking a ball around in the Roche Bois suburb of Port Louis and harbouring dreams of playing at the highest level. He was encouraged to pursue them when he met former Mauritius defender and national coach Mamade Elahee. Appou revealed: "I still recall one day after a game for the inter primary schools competition Mr. Mamade Elahee approached me and told me 'you have talent, continue to train hard and one day you will go far'. "His words have always stuck in my mind and the passion has driven me to be here." The combination of inspiration and perspiration has paid off handsomely for Appou, who played in World Cup qualifiers in 1998 and 2006 and has scored 10 goals in 26 international games over a 16-year period. And he is still being picked to represent his country - on merit. "He is talented, he is fit and keeps scoring in the domestic league and any coach would like to have this type of player in his team", national coach Akbar Patel told BBC Sport. "Appou is an example to be followed as he can score at any time, when you least expect it. He always has a good placement on the field and he is as cunning as a fox in the box." As well as his performances, Appou holds a position of influence among his team-mates, helping to guide the younger players and offer them advice. "They come to seek for my help and call me pappy", he said. "On the field I partner Gurty Calembe, who is half my age, and he has a bright future - the advice I have given him, he has put into practice. "These guys are talented but unfortunately we are a small country, lost in the Indian Ocean, and do not have frequent international exposure. "This is what is lacking for Mauritius football to make a comeback." The perfect chance to show what they can do will come next year at the Indian Ocean Islands Games in Reunion Island. And it will also give Appu the opportunity to fulfil two more ambitions - to become the oldest international goalscorer, a record held by Singapore's Aleksandar Duric who scored against Malayasia in 2012 when he was 42 and 105 days, and to taste success with his country. "I want to be there to win silverware for my country," he said. "Winning gold at the IOIG 2015 will be a great achievement as supremacy in the region is important."